(i) Place the DS2V.EXE, a DS2.EXE and the DS2VD.DAT files into an empty directory (folder). (ii) Run the visual interface DS2V.EXE. The data may be reviewed through the green button. A user guide for Version 4 is accessible through the purple button and a program description through the light blue button. (iii) A new DS2.EXE run may be started from the “mini-console” in the lower left hand corner (Start &Send 3). (iv) The orange button may be used to create a movie of a flow that employs unsteady sampling. View example. 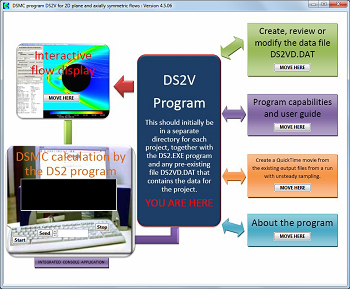 (v) The “Interactive flow display” may be then selected and the full details of the calculation, the flowfield, and the surface distributions are then available in the separate windows after reading the files from program DS2. (vi) Alternatively, DS2.EXE may run in a command window and, once the restart files have been written, DS2V.EXE may be run in a post-processing mode. 1. These programs are largely unchanged from those on the previous web site. However, the executables have been produced by the latest Intel compiler and a number of minor errors have been corrected. 2. The “new” chemistry model had not been fully implemented in the code and that was noted in the data menus. This remains the case, but a Q-K model implementation, similar to that in the DS1V program will soon be added. 3. The downloadable executables are Windows applications that are designed to run on a single CPU. The RealStudio visual interface can be compiled also for Linux and Apple OSX and the FORTRAN source code can be compiled for any system. I do not have the resources to do this and, despite very many requests, the DS2V source codes will not be made freely available. The source code for the DS1V program has been made available, but this is primarily for scientific applications. The DS2V is largely applied to engineering studies and the source code of early DSMC engineering codes had to be released because of the limitations of early FORTRAN versions. I then attended many conferences where obviously unphysical results that were caused by inappropriate modifications to the source code were attributed to “Bird’s program”! 4. Despite the comments in the third note, the source code has been made available to several individuals and, in particular, Dr. Martin Rose MRose81@gmx.de has developed a parallel version of DS2V, primarily for Linux. Those who wish to make large parallel DSMC calculations on Linux clusters are encouraged to consult Dr. Rose. 5. While I no longer wish to spend so much of my time supporting DS2V, I would like to be informed of obvious bugs. Download the sample data file DS2VD.DAT for supersonic sphere flow with upstream facing jet.